Beloved and I had dinner at Lugang Cafe last night. This internationally-famous Taiwanese restaurant-slash-cafe is among our more pricier ventures, but Beloved mostly heard positive feedback here from her friends. I personally haven’t heard of it until recently, when they opened doors to a new branch at an accessible (to us) SM North EDSA, probably because of it being pricy. Of course, we’ve had other pricy ventures before, and it mostly turned out well, so we gave this a shot. The place was packed full. Luckily, they were able to accommodate us immediately. Unluckily for those who went after us, they had to wait a while. This further raised my expectations of this cafe, especially after they handed out the menu. Their dim sum, which I already raise my eyebrows when they pass the 100 Php mark, cost no less than twice of that. However, we already know that their xiao long bao is the must-order in this place. With a few to choose from, we settled for the Steamed Angled Loofah with Shrimps Xiao Long Bao (228 Php). We had a hard time deciding what else to order, since we were hoping not to break the 1000 Php mark. We settled for two noodle dishes: their Spicy Beef and Tendon Noodles Soup (250 Php) and Minced Pork in Bean Sauce over Noodles (230 Php); and their Spring Onion Pancake (160 Php) house specialty. Since this was a cafe, they had an entire menu filled with drinks and cafe-style desserts. Sadly, they didn’t have what Beloved originally wanted: milk tea and a different flavored smoothie. She settled for their Peanut Smoothie (200 Php). 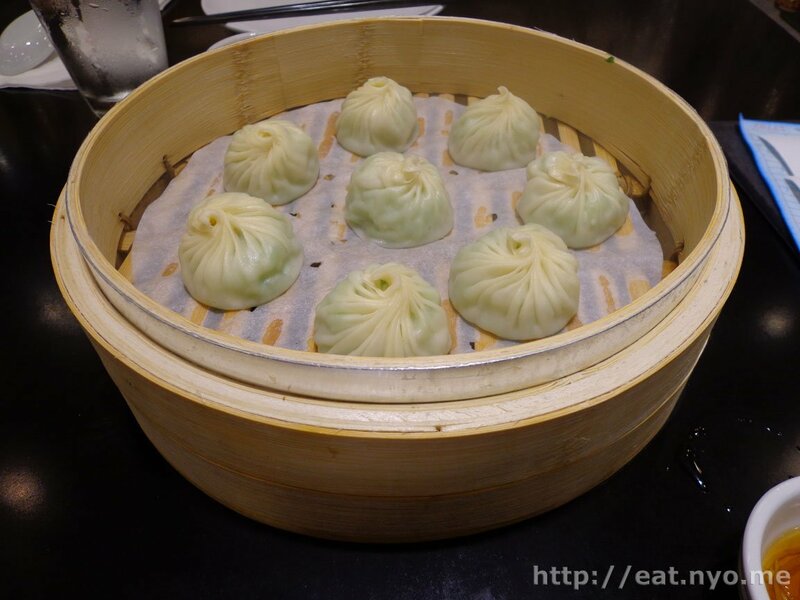 Our steamed order, their Steamed Angled Loofah with Shrimps Xiao Long Bao arrived first. These were eight pieces of freshly steamed soup dumplings. Each of them was filled with bite-sized portions of soup with shrimps and said vegetable. Honestly, it wasn’t as great as I expected, but I must admit that this is one of the easier xiao long bao we’ve had, since the dumplings stick easily to the chopsticks, making the Chinese soup spoon optional. Take care, however, because the stuff inside is piping hot! 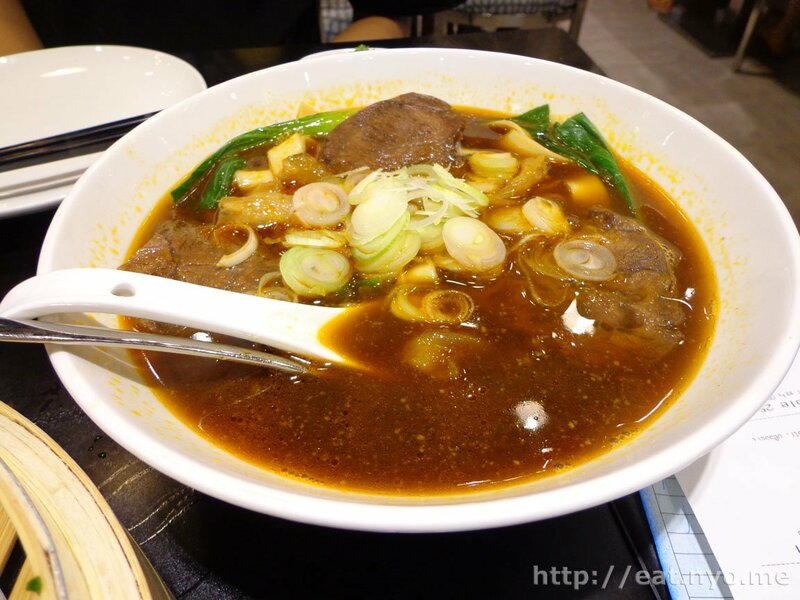 Our first noodle order arrived next: the Spicy Beef and Tendon Noodles Soup. I quite liked this soup. It was spicy, yes, but it was a good kind of spicy, one that I can tolerate because I was still able to enjoy the underlying beefy flavor. The beef was nice too. They were quite tender, and the tendons were very gelatinous. Oh, and for its size, it could definitely feed two, maybe three. I’m not sure if this arrived before our other noodle dish, but what the heck. 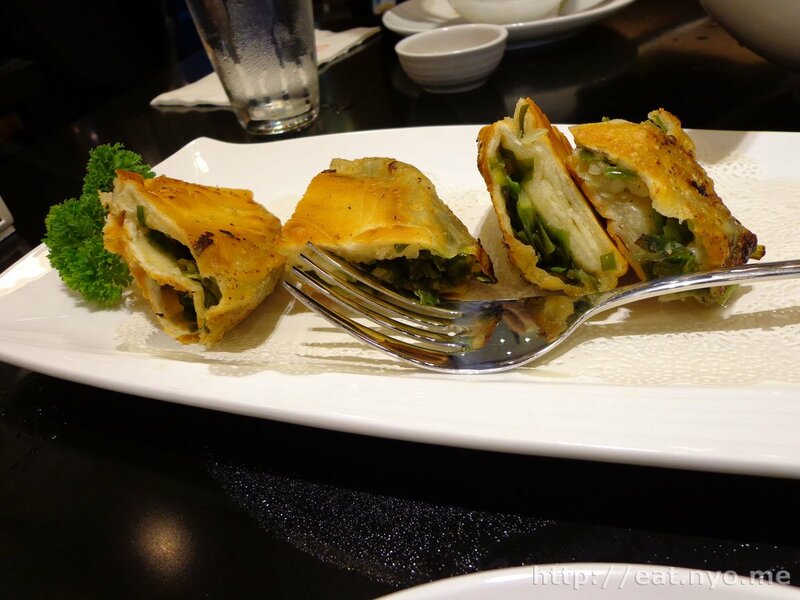 This is their Spring Onion Pancakes. This was my favorite dish of the night. A simple dish, these were simply packets of fried rice dough filled with stir-fried spring onions. What I liked the most was the crispy outside and somewhat chewy inside that went well with the mild spring onion taste. 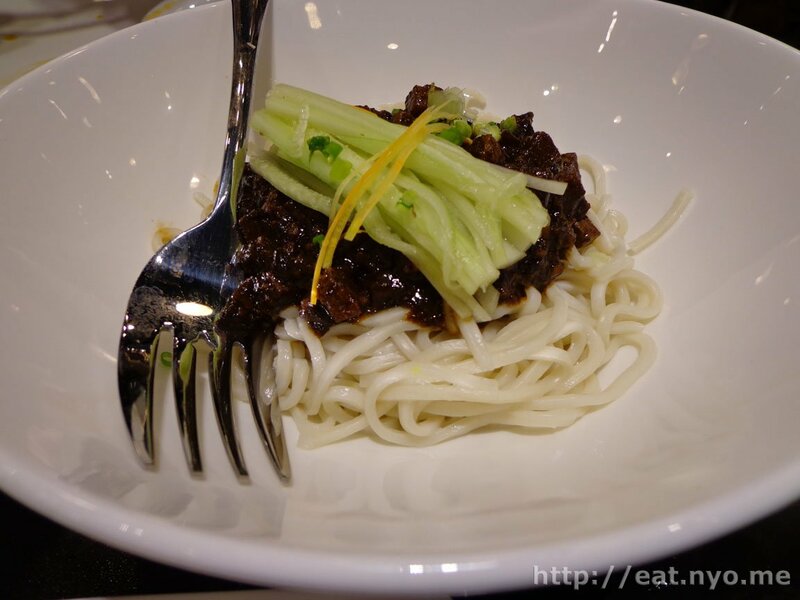 Our other noodle dish, the Minced Pork in Bean Sauce over Noodles, made me wish we ordered rice instead. Quantity-wise, it was okay. Similar to our noodle soup order, this could easily be shared among two, maybe three. Don’t be fooled by the fork in the picture, because that’s a serving fork a few times larger than your regular dining one. This was essentially a pasta dish—noodles with black bean sauce and pork. I could tell they used pork liver in addition to the meat, which was probably why Beloved didn’t like it as much. It was fine for me, but our other orders overshadowed this by a lot, perhaps because it was a noodle dish like the rest. Our dish to end the night, their Peanut Smoothie, arrived last. 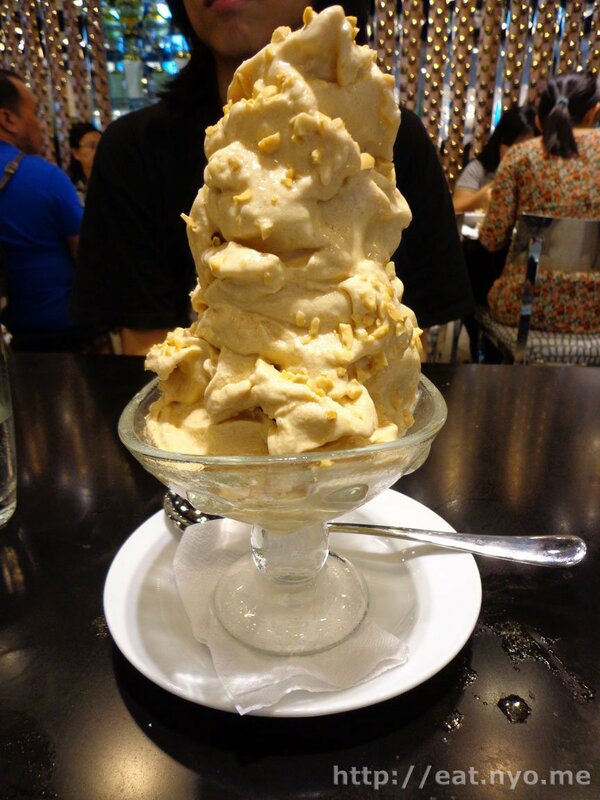 This humongous pile of basically iced peanut butter could barely be contained on the goblet it was served in. We heard from the other table that it could feed five, and I might agree, except it was Beloved and me we were talking about here. I can confidently say I can easily finish an entire order of this. I found it somewhat difficult to consume. Although it had the consistency of ice cream, it tasted purely like peanut butter placed in the freezer for a very long time. What made it difficult aside from the temperature was that it melted as you go. Beloved and I split it in half, and by the end of it, we were both shivering. All in all, it was an okay visit. I was pleasantly surprised that we were given a special promotional discount which made our bill drop from over 1.2k to our goal of under 1000 Php. The only dish we didn’t really enjoy as much was the pork and bean pasta, but the rest ranged from okay to good. I’m pretty sure Beloved enjoyed this a lot, especially since she was able to consume half a mountain’s worth of frozen peanut butter. I’m pretty sure I won’t initiate another visit here, but that’s just because I don’t really fancy their menu items, and I’d rather go to a regular Chinese tea house. However, I have a feeling Beloved will do so just to try the other stuff from Lugang Cafe’s second menu. Location: SM North EDSA, the Block. Recommended for: Dessert lovers, large parties of Chinese/Taiwanese food lovers. Smart nomnomnom tip: All their dishes are your typical Chinese tea house/restaurant servings: good for sharing.